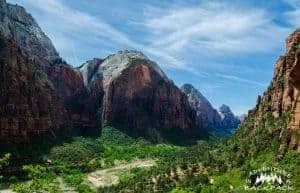 Hiking Angel's Landing in Zion National Park was highly recommended to us by locals as well as reviewers online. When we arrived in Zion National Park, we were apprehensive about the amount of people, as per the usual with national parks. However, we were excited to see the beautiful park and hike some trails! 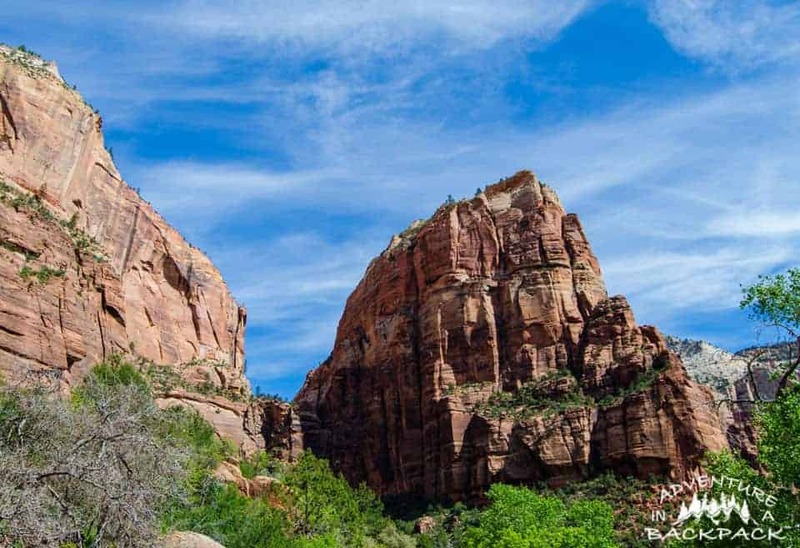 How Difficult Is Hiking Angel’s Landing? This is definitely a strenuous trail. At about 5 miles out and back, you are hiking around 1500 feet of elevation over 2.5 miles, which is pretty steep. The first mile is on a paved sidewalk, although it is at an incline. At about 2 miles into the hike, you reach a landing that is still below Angel's Landing. This is a great viewpoint and a great place to take a break before continuing your trek. The last half mile of your hike is very strenuous – both physically and mentally. There is a sheer 1,000+ foot drop off on both sides, and you must be careful. It is by not incredibly narrow other than on a few short points, but the elevation and the drop offs do get to your head. How are the Drop Offs Safe on Angel’s Landing? As mentioned, when you are hiking all the way up Angel's Landing, you are going to be traversing across a narrow drop off. The park has put up a chain for you to hang onto, which makes traversing a bit easier. Personally, I thought the chains got to my head more than actually helped me, as I am sure-footed enough to get across things like that without the aid of a chain. To me, it seemed more of a last resort. But there were hikers of all types on the trail, and many needed the chain for safety. As you are hiking across and up this narrow and steep trail, the most dangerous thing on the trail are the other people. As this is a very popular trail, there are hundreds of hikers on the trail at the same time. First disclaimer is that I am not comfortable in any situation where there is a high density of people; clubs, grocery stores, etc. I get some anxiety when there are more people in one place than I think there should be. Second disclaimer is that I do understand that people need to learn things like trail etiquette; and that’s why we write these blogs! We love to educate people, but sometimes I am not comfortable with people learning at my expense (especially when there is a 1,000-foot cliff next to me). That said, there are hundreds of people trying to traverse this very steep and narrow trail with only one chain for safety, and many of them don’t understand trail etiquette. There were several times when the trail became very narrow and hikers coming the opposite direction failed to yield in order for a group to get past. One group goes up, one group comes down, etc. Not hard, but there were people trying to push past when pushing past could have caused someone to die. Not cool. So, are the drop offs safe? Of course they are, so long as you use caution and common sense. If you have a fear of heights, they are not safe. They are not safe for young children. But so long as you are physically and mentally able to hike a steep trail, they are safe. Only 6 people have died on that trail in the last 6 years; and whereas that sounds like a lot, consider the number of people who hike it every day and it really isn’t very many. Also considering the number of people doing not-so-safe things at the top, I’d venture to say that a hiker using caution and common sense will have a very slim chance of dying on that trail. 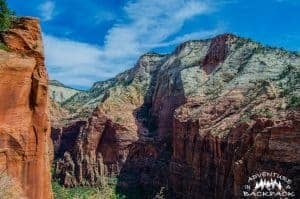 Is it Worth Hiking Angel's Landing? In our opinion, no. The views are spectacular. The climb is strenuous (which is great!). The top of Angel's Landing is phenomenal. However, with the people, the chains, and the sidewalk most of the way up, it feels more like a zoo than a hike. Sadly, it just didn’t do it for us. If you are the type that doesn’t mind crowds, doesn’t mind a tight situation, and enjoys a strenuous hike, I’d say it would be a great hike! If you do decide to try hiking Angel’s Landing, I recommend getting a very early start on it to lessen the crowds. Overall, this hike did not meet our expectations. That is very unfortunate because the views are spectacular. But the people didn’t work for us. To each their own. If you like less crowds, check out our post over Fairyland Loop in Bryce Canyon National Park!